Saturday November 23rd 1901 I hurried through my work and took Mollie down town I did a little trading and brought Mother out with me. We had such a good visit. I took her home before night. They have the shed nearly shingled it looks well. Sunday November 24th 1901 It rained nearly all forenoon. I was busy about the house I neglected my work yesterday. I read and wrote in the afternoon. Mollie came tonight. Monday Novmber 25th 1901 I had churning to do and dinner to get I started to work in the afternoon. Mother and Fannie came. I put the clothes to soak. a nice day. 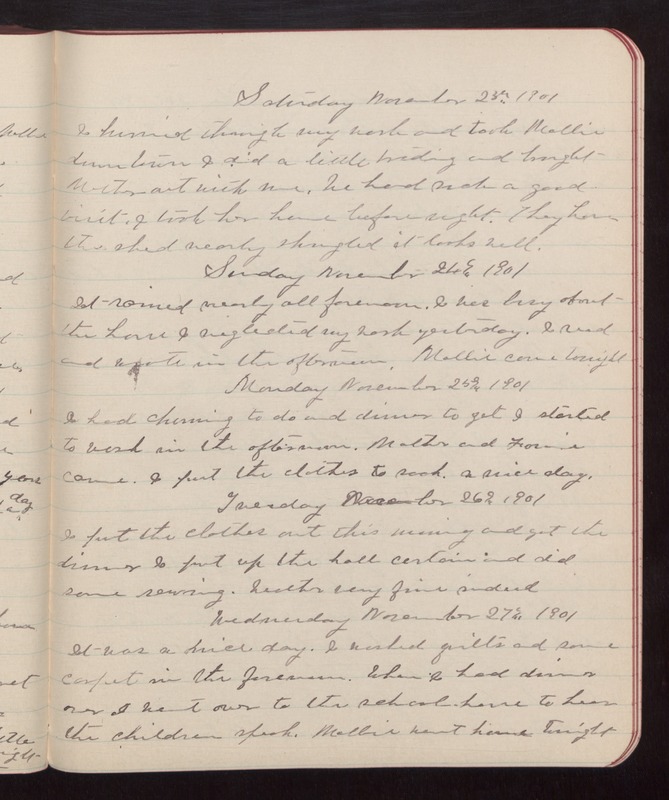 Tuesday November 26th 1901 I put the clothes out this morning and got the dinner. I put up the hall curtains and did some sewing. weather very fine indeed. Wednesday Novmber 27th 1901 It was a nice day. I washed quilts and some carpet in the forenoon. When I had dinner over I went over to the school house to hear the children speak. Mollie went home tonight.